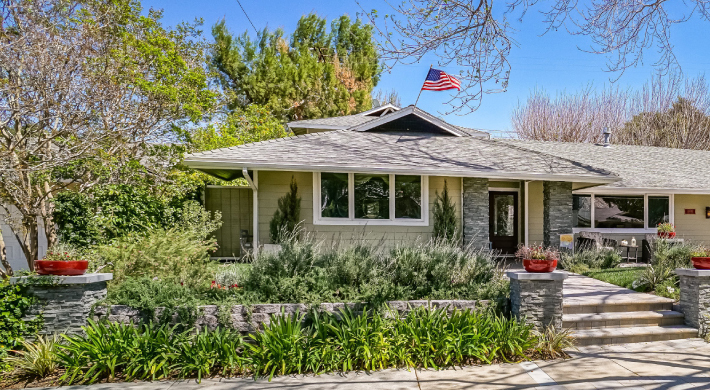 This beautiful cul-de-sac home shows true pride of ownership, with four bedrooms, four baths and an expansive 2,893 square feet. You'll love the paver driveway, newer windows and siding, efficient new air conditioner and copper plumbing, as well as the custom designer touches throughout. From double-leaded glass-entry doors to an elegant formal living room with upgraded carpet, recessed lights and custom dual-sided fireplace in both living room and dining room, to the gourmet kitchen with gleaming-granite counter tops, stainless-steel appliances, instant hot water, Monogram refrigerator, range with pot filler, Fisher & Paykel two-drawer dishwasher, center island with breakfast bar, upgraded cabinetry with under-cabinet lighting and soft-close doors - it has everything! Be sure to check out the custom wall painting in the family room that adds to the charm, plus a bar and custom lighting. Business is always personal. That's why the Finance of America - Santa Clarita team is committed to educating, empowering and assisting you with accomplishing your goals and plans for your financial future. Whether you want to purchase a new home or refinance your existing property, their wide variety of home loan products paired with their team of knowledgeable, seasoned mortgage advisors ensures a perfect fit. They hold themselves responsible to doing everything they can to put more knowledge and power back into your hands; that's why they're ready to patiently answer your questions and share their know-how with you. Get in touch to find out how good a personalized, warm and truly-helpful meeting with a Finance of America mortgage advisor can be. 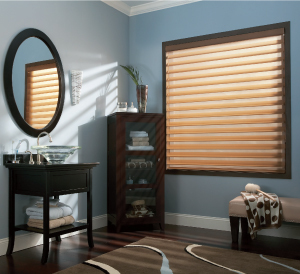 Custom blinds and shutters not only add taste and refinement to your space; they also add value to your home! Right now, rebates starting at $100 for qualifying purchases are available through the Hunter Douglas Celebration of Light Savings Event that runs through June 25. See the ad on page 29 for details. Buying a home is one of the most exciting, and oftentimes overwhelming, decisions we make. We dream of a place to call our own and build our future - and that's exciting. But it also comes with a lot of questions and unknowns. Before you get started, take a few minutes and consider these four questions. 1. What are the costs of owning a home? Consider that the monthly mortgage is not the only cost you will face. You need to budget for homeowner's insurance, association dues, home maintenance costs and utility bills - and be sure to allow for property taxes, which may be rolled into your monthly payment. 2. How much house can I afford? Here's a good estimation method: You usually can purchase a home with a value of two or three times your annual household income. However, the amount you borrow will depend on your employment and credit history, savings and debts and the amount of your down payment. 3. What are the benefits of homeownership? Enjoy the savings that can come when you deduct your property taxes and mortgage loan interest on your federal income taxes and possibly your state taxes. With every loan payment made, you build more equity in your home. This equity is like a savings account that you cash in when you sell or borrow against it. 4. Which type of home loan fits me? There is no simple formula to determine the type of mortgage that is the best fit for you. This choice depends on a number of factors, including your current financial picture and how long you intend to stay in your home. Dreaming of a beach-side home to escape to on the weekends, or after retirement? Read on, because you'll be shocked at how affordable it is to make that dream a reality. Channel Islands Harbor in Ventura County, just an hour from the SCV, is drawing a noticeable number of Santa Clarita residents whom are attracted to the community's affordability, climate and accessibility. The Channel Islands Harbor area offers the lowest-priced waterfront homes in So Cal, both for beach and marina properties. Harbor homes with docks are a third of what you'd pay in Newport or Huntington Beach - plus Channel Islands Harbor is significantly closer, increasing the likelihood of weekend residents using their homes frequently. Condos on the harbor start at $550,000; boat-dock homes start at $900,000; beach properties are from $750,000; and ocean-front homes start at $2.5 million. 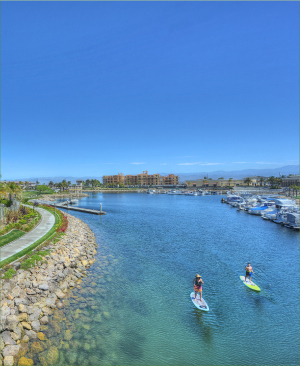 Full-time and part-time residents enjoy cruising the harbor, fishing, experiencing the local fine-dining scene, spending time in nearby Ventura or simply sitting out on the deck and watching the boats and kayakers. There are recreational boating tours to the islands, skin and scuba diving, paddle boarding and much more. It's only 35 minutes south of Santa Barbara, too. Keith & Arlene Beckwith of Keller Williams Ventura County are the number-one sales team in the Channel Islands area and have sold more than 200 properties in the community. They live and work in the harbor and currently have 18 listings available.